One Velvet drawstring bag of nice quality all natural Faceted Gemstones in a variety of sizes and shapes (emerald cut, round, oval, trillion, square, marquise, heart, pear, fancy cuts, etc). Sizes vary from approx. 1 to 4 carats, with the average size stones weighing about 1 to 2 carats. All the gemstones can go directly into a ring, pendant or earring setting. All the gemstones are absolutely gorgeous as the picture above indicates. These gem bags would make a great gift for the collector, investor, or the person who just loves gems or jewelry. 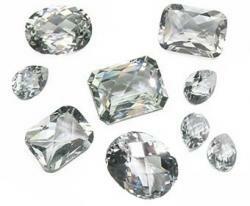 These lots are a very economical way to purchase quality gemstones and build your inventory.